Been very busy with the day job and too busy playing radio so this post will be a bit of a catch up! I have been using my newly built datamode interface in anger. As well as running WSPR on occasion I have also been active using JT65-HF. JT65 is a communication mode developed by Joe Taylor, K1JT, (specification here) originally intended for amateur radio communication with extremely weak signals such as Earth-Moon-Earth (EME) contacts on VHF it has gained popularity on the short wave bands using JT65-HF an adaptation of the JT65A protocol. Being restricted to 10W it is an attractive method of making contacts. The protocol includes error-correcting features that make it usable even when the signals are too weak to be heard or are being subject to interference. Thankfully the project was open source and Beat Oehrli, HB9HQX as developed his own version with the catchy title JT65-HF-HB9HQX-Edition, available at http://sourceforge.net/projects/jt65hfhb9hqxedi/ This is the version I have been using with great success, the colour coding and simple button pressing makes a QSO straight forward and the built in logging and exporting make uploading to QRZ, eQSL and HRDlog painless. I have been active on the 10/20/30 and 40M bands over the past few weeks making contacts with Bulgaria, Canada, Denmark, Germany, Greece, Iceland, Kazakhstan, Poland, Russia, Serbia, Sweden, Thailand, Ukraine, USA and Venezuela. I soon appreciated that using headphones rather than the speaker made life easier but I was still using the stock supplied hand microphone. Several times I have found it difficult to make myself understood and suspected that not only am I plagued by my ‘Black Country‘ accent and poor enunciation but maybe the microphone wasn’t quite cutting it. Not able to afford or justify the purchase of a Heil headset just yet I took inspiration from Charlie M0PZT and his recommendation for a budget solution using a £10 computer headset from CPC (product AV21444). On the Yaesu FT-857D the microphone connector is a 8-pin RJ45 socket which is behind the removable front panel with the lead coming out of one of a number of openings. Whilst the panel is easily removable I didn’t want to keep removing it when switching between microphones, also re-purposing an obvious CAT5 network lead was problematic as they are often thicker than the openings. A quick look at the supplied Yaesu MH-31 microphone revealed it can be unplugged, so what I needed was a interface box where I could plug in the headset and the microphone lead. This would also allow me to try different headsets in the future. Most microphones designed for computers use electret elements which require a bias voltage, this is quite simple as the Yaesu microphone connector supplies 5V, so a simple resistor (8.2K) will supply this, also by using a couple of different capacitors and a switch I can select a ‘thin’ higher frequency response (for DX work) or a more normal ‘fatter’ response. 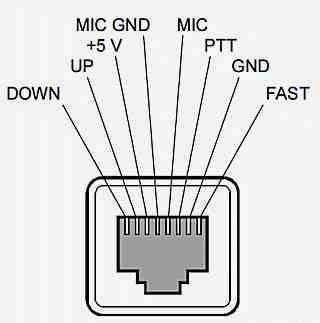 A circuit can be found on George Smart’s webpage, the bias is simply applied to the tip of the microphone jack. The box also has a PTT switch, this could have simply grounded the PTT line but I wanted to have a LED indication on the box and again I could have just wired a LED and resistor to 5V and to the PTT line so it would light when the switch was closed, pulling PTT to ground and completing the circuit. I opted to use a simple transistor open collector switch to add a little isolation. 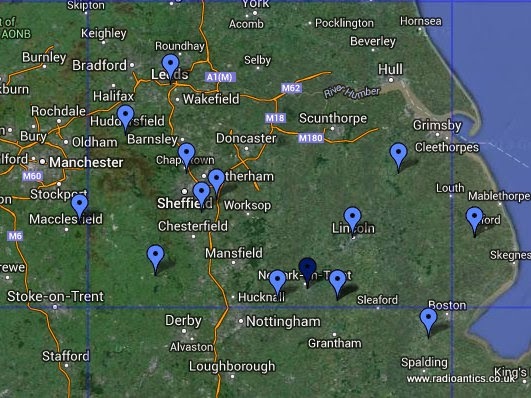 My first contest back in January was the 50MHz UKAC and as I blogged I made a solitary contact due to antenna issues, i.e I didn’t really have one! I missed the February contest so this month I really wanted to have a decent stab at it which meant building an antenna. I decided early on that a Moxon was probably the easiest to construct, so I downloaded the MoxGen program to calculate the element lengths. Using 1mm diameter ‘garden wire’ for the driven element and reflector. I had various bits of flexible plastic pipe kicking about and decided to use them to construct an x-shaped spreader, unfortunately the pipe was obviously from different batches and as soon as it was tensioned by the wire it bent into all sorts of strange shapes due to the different elastic properties so I abandoned that design. I had left the build to the last minute and needed a quick solution, so yesterday morning plan-B was to go an get some cheap timber from the local B&Q on the way to work and build a simple frame to wrap the wire round. Coax and common-mode choke, and sturdy support! I impressed myself by completing the construction of the frame in the short time I had at lunchtime! One thing I hadn’t appreciated was just how big the final antenna was, it wasn’t heavy just big! So last night an hour before the contest started I fitted the choke balun and coax to the terminal block. To be safe I removed the other antenna from the mast and hoisted her up. Moment of truth, thankfully the VSWR was around 1.5:1 at 50.2MHz, rising to nearer 2:1 at the top end of the band. Not ideal but close enough. The VSWR measurements would suggest that the Moxon is a little bit long, interestingly some online Moxon calculators suggested dimensions for a slightly smaller Moxon than the downloaded Moxgen program did? Something to tweak/experiment with possibly using some thicker wire to increase the bandwidth. I was sorted! Moxon antenna up, contesting headset and interface plugged in and a quick scan up and down and I could clearly hear several stations testing and setting up. I poured myself a beer and soon the contest started. I finished the night with just 14 QSOs, more would have been nice and it wasn’t through lack of trying I could hear many more operators but simply couldn’t make myself heard either because the antenna was in wrong direction or due to low power and getting lost in the pile ups to stronger stations. I was not disappointed in fact I was quite happy with what my 10W, my new headset and home brewed antenna had achieved. The Moxon showed great promise and directional characteristics but for some reason just couldn’t get south as the map indicates. Out of interest I wondered what the line of slight view from my mast looked like so I strapped a camera on to the moxon this afternoon.. Need more height I think, especially if pointing South and a rotator would be nice! This entry was posted in AmateurRadio.com, contest, dx, headset, jt65, jt65-hf, moxon, ukac. Bookmark the permalink.